* What did it mean to "be Christian" in late antiquity? Honoring the groundbreaking work of Gillian Clark, leading scholars explore this intriguing question. Discover how literature, writing, reading, and hearing influenced spiritual formation; examine ways believers created and maintained ancient communities; and learn how gender, location, and other "particularities" shaped the definition of "Christian." 336 pages, hardcover from Oxford University. What do we mean when we talk about "being Christian" in Late Antiquity? This volume brings together sixteen world-leading scholars of ancient Judaism, Christianity, and Greco-Roman culture and society to explore this question, in honor of the ground-breaking scholarship of Professor Gillian Clark. After an introduction to the volume's dedicatee and themes by Averil Cameron, the papers in Section I, "Being Christian through Reading, Writing, and Hearing," analyze the roles that literary genre, writing, reading, hearing, and the literature of the past played in the formation of what it meant to be Christian. The essays in Section II move on to explore how late antique Christians sought to create, maintain, and represent Christian communities: communities that were both "textually created" and "enacted in living realities." Finally in Section III, "The Particularities of Being Christian," the contributions examine what it was to be Christian from a number of different ways of representing oneself, each of which raises questions about certain kinds of "particularities," for example, gender, location, education, and culture. Bringing together primary source material from the early Imperial period up to the seventh century AD and covering both the Eastern and Western Empires, the papers in this volume demonstrate that what it meant to be Christian cannot simply be taken for granted. "Being Christian" was part of a continual process of construction and negotiation, as individuals and Christian communities alike sought to relate themselves to existing traditions, social structures, and identities, at the same time as questioning and critiquing the past(s) in their present. Carol Harrison was born and educated in the North East of England and has spent very little time away from this region. She read Theology at Lady Margaret Hall, Oxford and continued her doctoral research in Oxford and Paris. She taught at Hull University for a year but was soon drawn back to live and work in the shadow of Durham Cathedral. She has taught in the Department of Theology and Religion at Durham since 1989 and is currently Professor of the History and Theology of the Latin West. As with the North East, she has spent very little time away from Augustine of Hippo, and has previously published three books on various aspects of his thought with OUP. Her latest book The Art of Listening in the Early Church (2013) represents a departure from Augustine, although she has found it impossible to leave him behind. Caroline Humfress (PhD Cantab.) is Reader in History at Birkbeck College, University of London. Before moving to Birkbeck College in 2004, she was Carlyle Research Fellow in the History of Political Thought at the University of Oxford and Assistant Professor of Law and Rhetoric in the Department of Rhetoric, University of California at Berkeley. She is the author of Orthodoxy and the Courts in Late Antiquity (2007), as well as various edited volumes, essays and articles on legal history and Late Antique religion. Isabella Sandwell (PhD UCL) is Senior Lecturer in Ancient History at the University of Bristol. She previously held temporary posts at Kings College London and Birbeck College London. She is author of Religious Identity in Late Antiquity: Greeks, Jews and Christians in Antioch, as well as a number of other edited volumes, essays and articles on late antique religion and society. She is currently working on late antique preaching and audience reception of it. 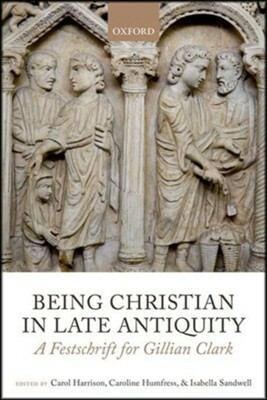 I'm the author/artist and I want to review Being Christian in Late Antiquity: A Festschrift for Gillian Clark.